The modules in this Review of Aeronautical Meteorology course are being offered by The COMET® Program to serve the continuing education needs of international aeronautical forecasters. The modules and module sections listed in the Course Outline have been chosen as the most useful materials COMET offers for aeronautical forecasting training needs. Many additional modules from the MetEd Website may be useful for individual forecasters, depending on their geographic locations, degree of forecasting experience, and current level of hydrometeorological education. 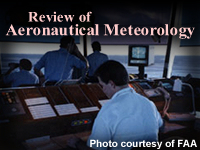 The goal of this course is to improve knowledge in many meteorological areas important for aeronautical forecasters. On its own, it will not help forecasters meet all the requirements under WMO-258 Guidelines, but it can contribute substantially to such a curriculum. The instructional objective for this course is to provide a review of selected topics related to convective weather, fog and visibility, tropical meteorology, synoptic meteorology, mesoscale meteorology, aeronautical forecast operations, aviation icing, and some pertinent climate topics. Please see the specific objectives related to each module under the individual descriptions for each module. This review course consists of seven parts. Total time required for all parts is approximately 56-63 hours if the entire modules are completed. A Spanish-language version of this course, which offers a portion of the modules in Spanish, is also available. A special thanks to Dr. John Cahir, Professor Emeritus, Pennsylvania State University, for compiling these modules as a distance learning course. See WMO Commission for Aeronautical Meteorology, which provides links to many of the best available aeronautical meteorology training and guidance material from around the world. Meteofrance offers guidance materials in French on aeronautical messages from their Website, Didacticiel sur les messages aéronautiques. For those requiring radar meteorology training, visit the NOAA NWS Warning Decision Training Branch Website to find a wide variety of materials. The Distance Learning Operations Course offers presentation materials for initial training on the use of doppler radars in forecast and warning decision making processes.